How come that a country like the United States has very strong business ties with communist China, but then has been fighting the small island of Cuba unsuccessfully for the last fifty years? 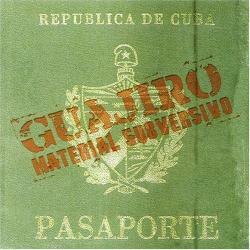 Guajiro is a band from Florida, consisting among other of two Cuban exiles, that has apparently found strong support in right wing communities. Punk and conservatism are two things that were never meant to belong together, and so you can try to enjoy Guajiro’s admittedly original take on Seventies punk rock with English, Spanish and Spanglish lyrics and its strong Latino influences as much as you like, but there stays always a very bitter aftertaste. The same way I would never listen to European right wing bands, I decline to like Guajiro who take pride that their album was denied access in Cuba. Other bands like the Manic Street Preachers didn’t only play in Havana in 2001, but they even got to meet Fidel Castro. Michael Moore filmed a part of his latest documentary in Cuba too. And with most South and Middle American countries finding their ways back to left wing governments, with Venezuela and Bolivia even having socialist leaders, even people like Guajiro should notice that those countries have had enough of the United States’ imperialist intentions. They have claimed in interviews that they despise kids who wear Che t-shirts to be liberal, and somehow don’t see that Che’s ideals seem to thrive south of the USA. Maybe it’s time Guajiro get their ideas set straight, because their songs aren’t bad after all: 7 points for the music, 1 point for their mindsets, which leaves us with an average 4 points. Hi. I'm Jorge Gonzalez, bass player for Guajiro. I was disturbed by your allegations that we are a right-wing band. That is far from the truth. We write about the aftermath and the fallout resulting from the politics of leaders like Fidel Castro and George Bush alike. We denounce injustice and oppression of any kind; religious, political, economic and sexual. We are in fact, very liberal minded individuals who believe in Love, Compassion and Peace and are saddened by the way all the governments of this world sacrifice humanity at the expense of "ideas". We champion individual thinking and freedom of choice. I was very hurt by the comments put forth in your review and I want to explain to you why. I was born in Cuba and saw first hand the abuses committed by the Cuban government against my family and the families of others. I remember when state security burst into our home in Habana in the middle of the night. Dressed in plainclothes, they tore my parent's house apart, gutting our mattresses, breaking our furniture, emptying our bookshelves, all the while threatening us at gunpoint; my mother crying and holding me in her arms and my poor father, who has done nothing wrong in his entire life, with a gun in his face. They were looking for my older brother, who had tried to leave the island. That was his crime. Should that be a crime? Should you not be allowed to leave a place, a person or a situation when you so desire? Is that not the truest definition of a prison? The antithesis of freedom? My brother was picked up later that day at a friends house where they we're hiding out. He was sentenced to four years in prison. This was 1980 and I was 7 years old when this happened and I didn't see my brother again for 10 years. Is that justice? Living in Cuba was, and still is, brutal and oppressive. If you have never lived in a communist state, it will be difficult, if not impossible, for you to understand that. Which is normal. That's the problem in discussions like these, because likewise, I don't know what it was like for the countless Vietnamese orphans whose entire families were wiped out by napalm (thanks to a misguided and murderous US foreign policy), But I'm aware that it happened and it disgusts me. So why are there so many people that still sympathize with Fidel Castro and his revolution that went so wrong? A revolution that slowly took away private property (like the Nazis did with the Jews slowly over time in Germany). A revolution that destroyed the Cuban ecomony and left a once beautiful and vibrant country in shambles; A revolution that split families apart, mother from daughter, father from son brother from brother; A revolution that has killed women and children to make it's point. There is no difference! But I'll tell you why people don't notice this: it's the same as the people in the states that still think the Iraq war was the right thing to do; That don't think there was anything wrong with Vietnam; That don't even know about the CIA and all it's excursions into the political affairs of other countries. The fact is that most people, whether you are from South America or Texas, don't take the time to educate themselves and just regurgitate everything they have been told by other people who have their own an agenda. Whether it's by FOX news in the US or El Granma in Cuba. My point is that NO ONE is infallible. Our leaders are human beings, they are not deities; Che Guevara was a man full of contradictions and imperfections. He saved many people with his bare hands as a doctor and on the other hand presided over illegal trials that executed hundreds by firing squad (many who proclaimed their innocence as the bullets perforated their bodies); Fidel let history take it's course and allowed Che to die in Bolivia and has destroyed Cuba in order to prove a point; Mao persecuted intellectuals with his "Great Leap Forward" economic program that included forced evacuations of Chinese cities and the purging of "class enemies" (intellectuals and professionals) in the "year zero" (1958-1960) which caused the deaths of 14,000,000 Chinese; Stalin not only killed millions of his own people but massacred hundreds of thousands of poles without reservation. All because of what? Pride. Arrogance. They all thought they possessed the truth exclusively in their hands. They we're wrong and anyone in the future who believes this will be wrong again. There isn't a single country in the world that hasn't committed atrocities and sacrificed their own people in the name of Nationalism or Communism or Imperialism or Colonialism or Catholicism or whatever other nonsensical ism you can think of. Guajiro is not a right wing band. We are in fact American liberals. If you go to our website you will find English translations of our lyrics that will explain a lot. We avoid opinions because we have enough sense to understand that they are borne of man and his personal experiences, and are therefore subjective and imperfect. It's 2008 and It's too late in the game to spew such nonsense about such important matters like freedom and respect for the rights of others. Live your life a little more and cultivate your compassion for others and maybe you can get your ideas straight. Have compassion for the sufferings of others and in particularly in this case, for the Cuban people who have suffered so much. PS Venezuela voted against Chavez two months ago. They said NO to communist-socialism. First of all thank you very much for providing me with your view of things. Secondly, I want to tell you that I am not a teenage communist, but that I have been doing this kind of thing for nearly 20 years now. I will be 36 years old this coming Spring, consider myself a Socialist with left wing libertarian leanings, and have lived in the USA for one year and have visited communist countries twice, before the fall of the Iron Curtain. I believe in peace and freedom, just like you, and I also agree with some things you write: Cuba shouldn't execute people (neither should the USA or any other country on this planet), Cuba should let those go who want to leave the island, and Cuba should also should not imprison people with dissident opinions. Both of us though were too young to remember the Revolution. I believe you when you say that Castro and Che both executed more people than was necessary, but then we should ask the question why the Revolution happened in the first place. The same question why Latin American countries democratically vote for people like Chavez and Morales. This all happens because the USA don't respect those countries. With programs like NAFTA, they take the riches of the countries and let them live in relative misery. So how come that a country like Cuba, which has suffered for decades under American trade embargo, has a higher literacy rate than US backed governments in Middle America? You may say those things are just communist propaganda, and they may well be, but on the other hand, if you read all kinds of news sources, you don't know what to believe anymore. I know that a guy like Michael Moore (have you seen "Sicko"?) is also trading with simple propaganda, but he's just doing what the right in the USA has been doing all along. And the right had success with it. Just look what they did to Clinton with Monica Lewinsky. It is a documented fact, I dare say, that most Cuban Americans in Florida back the Republican party. They even have some Senators and Representatives with Cuban origins in the USA. It is also a documented fact that you gave interviews on a site called KillCastro (a war blog), hardly anything a liberal person would do. Another fact, which doesn't really have anything to do with Guajiro, is that we refused a few months ago to review an album of your label mates MOD who we consider to be too right wing to be admissible. The same will soon happen with a review of the latest Stuck Mojo album (on a different label than you), whose inflammatory lyrics are a sign of bad taste. I remember when I started listening to hardrock, heavy metal and punk rock music, it was all about being anti-Government. It was the mid to late Eighties with Reagan in the White House, and it was a true pleasure discovering all those angry bands who sang about freedom and getting rid of Reagan in the White House. So why do Europeans "love" Cuba so much? I can tell you sincerely that we all know in Europe that Castro is not some kind of saint, but in some ways he gets this respect by standing up to the Americans for all these years, while other regimes faltered and died. Cuba may even be one of the more humane communist regimes. Cuba has always been open to people from Europe, even though our governments didn't trade very much with the island. Fidel Castro has given the leadership to his brother Raul now, and I hope that this will start improving things for everyone involved. I cannot possibly say that I would like to see Cuba become a "democracy", because they would risk being sold to big money companies, and people would lose benefits (universal health care, free schools) they had under Castro. There should be a way to make everyone happy. At least I hope so. I respect your point of view, especially because it is obvious that you took time to develop it. If you want, I can reprint your email underneath the review, so that people also get to know your opinion. I will not comment on it but let people make up their own minds. PS: If you are American liberals, I hope that you share my and many of my friends and relatives hope that your next president will be Barack Obama. This man has the vision to heal the broken ties between Cuba and the United States of America. Thank you so much for your thoughtful reply Pascal. I'm glad that we have been able to discuss this; I feel we are brothers in mind and heart. There isn't single point in your letter that I would disagree with and I would be honored if you reprinted our entire dialog. Those first 8 years of my life spent in Cuba, I wouldn't trade for anything in the world. They were happy times for me and vitally important in the formation of my being. Our entire band is deeply concerned with the state of Cuba and the world in general. Our drummer, Doug Mckinnon, has visited Cuba on three occasions to study the music and culture which he loves so much. During his time there he lived with a family and became very close to them. From that experience he wrote the lyrics to "Santa Fe", a story of a man deciding wether he should leave or stay in the country he loves so much. I urge you to find them on the CD or go online and read them. The song disposes of politics altogether and goes straight for the visceral experiences of the joys of childhood and the pains of growing up. Two brothers from that family, which took Doug in like one of their own, are showcased at the end of the tune singing a beautiful chorus in the Yoruba language. Their names are Aruan and Arelan Torres. As far as the Kill Castro website is concerned, they are fans of the band and publish all our press releases that they receive from our e-mail list. Though we don't agree with everything they have to say, and they are aware of this, we still respect their right to say it and we defend that right. Once again, I just want to reiterate that we do not condone violence and intimidation. We are absolutely opposed to bloodshed in order to make change happen. PS We have a song in our live set now where we chant "Si se Puede". It's a futbol chant, but it so happens Barack has been using it lately as a translation to his popular "Yes We Can" slogan for the latino voters. So we take the opportunity to endorse the Obama campaign and call on our fans to help make change a possibility. You would be surprised how many Cubans in Miami are not voting Republican this year, specially in the younger generation.